The former residence of the Würzburg prince-bishops is one of the most important baroque palaces in Europe. It was begun for Prince-Bishop Johann Philipp Franz von Schönborn by the then young and unknown architect Balthasar Neumann (1687-1753); the shell of the palace was built from 1720 to 1744 and the interior completed in 1780. By the time the massive building was finished, the gifted architect had also served the brother and second successor of Johann Philipp, Friedrich Carl von Schönborn, and the two following Würzburg prince-bishops. The building costs amounted to a total of around 1.5 million florins – at a time when one florin represented a week's wages for a day labourer this was a massive sum. The building masterfully combines not only the various German baroque styles but also French château architecture and the imperial baroque style of Vienna. The result is a highly individual and distinctive synthesis of the arts. This was primarily the achievement of Balthasar Neumann, who not only had to find a way of meeting the often diverging wishes of the Schönborn family with their artistic tastes. He also had to evaluate and include in the planning the designs of leading contemporary architects such as Maximilian von Welsch, Lucas von Hildebrandt, Germain Boffrand and Robert de Cotte, which were commissioned for the purpose of introducing new ideas and competition and making corrections. 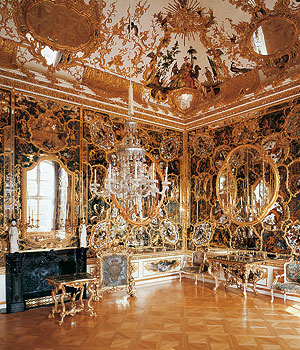 The interior of the Würzburg Residence was the finest of its age. At the Würzburg court three generations of artists and artisans from all over Europe produced an independent variation of the rococo style. 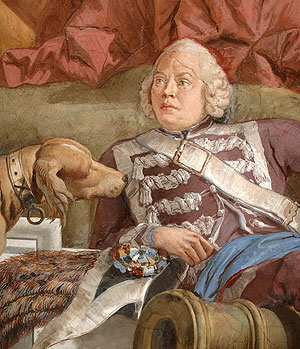 The highlights – and almost the final part – of the interior decoration were created by the Venetian Giovanni Battista Tiepolo with his ceiling frescos in the Imperial Hall and above the staircase, completed from 1751 to 1753. On 16 March 1945, only a few weeks before the end of the Second World War, a devastating air raid destroyed 90 percent of the Würzburg old town. The Residence was almost completely burnt out. From the attic the fire ate down through wooden ceilings and floors, and all the furnishings and wall panelling it had not been possible to store elsewhere were devoured by the flames. Only the core of the Residence, the vestibule, Garden Hall, White Hall, staircase and Imperial Hall with Tiepolo's frescos were saved. Neumann's stone vaults withstood the collapse of the burning attic. However, because the roofs had gone, further damage was incurred in the ensuing period due to damp. In the court church, for example, the most of the ceiling frescos by Rudolph Byss succumbed to the subsequent consequences of the fire in spite of the intact vault and had to be laboriously reconstructed. The rebuilding of the Residence, which cost around 20 million euros, is now complete and is a remarkable achievement, also from the point of view of the craftsmanship involved. Because a large part of the furnishings had been stored elsewhere and thus escaped destruction, it was decided to recreate the Imperial Apartments on the garden side and the Ingelheim Rooms in the north block as far as possible in their original form. In 1987 the process was concluded with the reopening of the Mirror Cabinet, a detailed reconstruction in verre églomisé technique.